Meatloaf is on the menu today. Hello and welcome to all my home chefs friends here on the East Coast of Africa and around this beautiful world we live in. 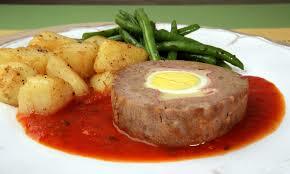 Today I thought we would do a tasty dish, which is also Banting friendly and easy on the budget strings. Yep I know that meatloaf has develop a reputation over the years through the family movies of being a boring, dull, put together dish .Well I believe we can change that into, not only a great dish, but also one which is fun and rewarding to cook. 500grams ground beef mince. (Can use lamb mince or ground turkey mince). ½ cup bread crumps (Banting dieters can use Banting bread). ½ cup + 2 Table spoons of Tomato sauce (ketchup in the USA). ½ cup finely chopped onions. 2 cloves garlic crushed peels removed or 1 tsp garlic paste. 1 large carrot cut into ¼ inch thick rounds. 4 large eggs I egg beaten.3 hard boiled eggs and set aside. optional (2 tsp. dry chili flakes). 4 Tbsp. Worchester sauce or H.P Sauce. 2 tbsp. brown sugar (Banting diet can use Xylitol). ¾ Tbsp. freshly ground black pepper. 1 tsp mustard paste or ½ tsp. dry mustard. Place all ingredients (except the 2 Tablespoons of ketchup) in a large mixing bowl. Wash your hands and then mix all the ingredients. 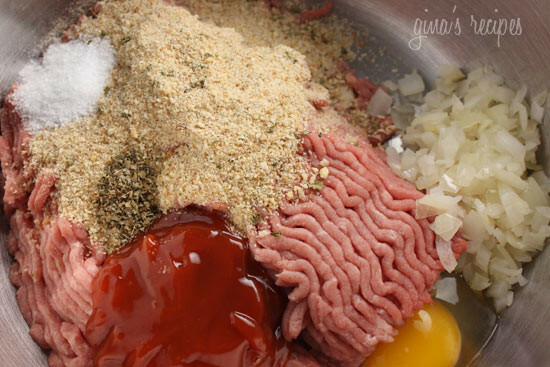 Place ½ of the ground beef mixture into a baking loaf pan. 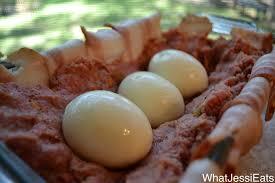 Enclose the peeled boiled eggs length ways in the middle of the mixture. Line the top with the rest of the ground beef mixture and the streaky bacon on top tucking the strips around the loaf. Spread the remaining ketchup on top of the loaf. Bake for 30-40 minutes, or until meatloaf is cooked through and is no longer pink. 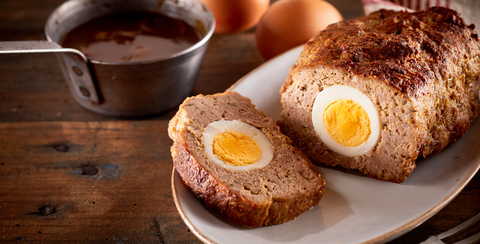 There are various accompaniments that will do justice to this delicious meatloaf, and here are a few for you to consider. Roast potato and freshy steamed green beans. Creamy mashed potatoes and fresh steamed peas. Creamy sweet potato mash (Banting friendly). Any salad Greek, French, Italian, Mediterranean or any of your choice. 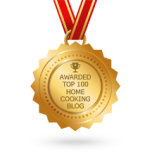 We really hope that you enjoyed cooking this meal with us here at Home Cooking Haven kitchen and that we have changed your perception of the dull old meatloaf.